It’s 2008. Oregon’s Heisman hopeful quarterback Dennis Dixon is off to the NFL, and the next man up, Nate Costa, has just suffered his second major knee injury. With two weeks before the season opener, left on the depth chart are sophomore pocket passer Justin Roper, a much heralded, but just arrived junior college transfer Jeremiah Masoli, and three true freshmen. Roper, already acclimated to Oregon’s system and speed of the game, starts the season — but Masoli finishes it. “Masoli took over, had a little bit of a rocky start for the first few games, then had a really good year,” said Roper, during an exclusive interview with FishDuck.com. Roper is now a quarterbacks coach at NCAA Division II Valdosta State University. 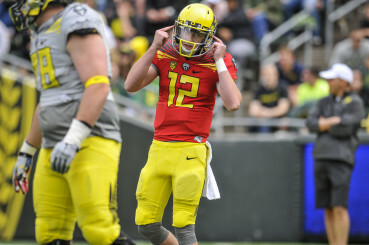 In 2015 the Ducks are looking at a similar situation when it comes to their quarterbacks. The starting spot is for career backup Jeff Lockie to lose. The junior should be pushed by redshirt freshman Morgan Mahalak in the spring and fall, but the hype around Eugene has so far surrounded the transfer of Eastern Washington senior Vernon Adams. Jeff Lockie takes a practice snap during Oregon’s Spring Game in 2014. “Vernon is not coming down here to be a backup his senior year and I don’t think Oregon would have gone out to go get him, to have him be a backup, and have him standing on the sidelines,” said former Oregon quarterback Chris Miller. FishDuck.com caught up with the NFL pro-bowler and former NFL quarterbacks coach last week. While Miller and many others believe Adams being named the starter is a foregone conclusion, the real question is when can he be ready to take over. Roper, who had a front row seat to watch the development of Jeremiah Masoli, has a unique viewpoint on Adams. After leaving the Ducks in 2009 Roper transferred to the University of Montana, and played in the same conference as Adams’ Eastern Washington squad. “Gaps that are open in the FCS level … they close a lot quicker in the Pac-12,” Roper said. Roper says that for Adams it won’t necessarily be learning the playbook that will be tough, but adjusting to the speed of the game and the different kinds of throws he will be asked to execute. “If I’m making a certain throw at Oregon, the timing of when I release the ball is quicker, how hard I throw that ball is a lot harder, less arc on certain throws because it gives the defense more time to go chase it … if he’s throwing a corner route at Eastern Washington, that same corner route is going to be thrown a lot differently at Oregon,” Roper said. The adjustment took time for Masoli, but by the halfway point in the season the starting spot was securely his. Roper says it’s possible the transition for Adams may be even quicker, but he’s skeptical about him being a week one starter. “It’s going to be very difficult for someone to come in and take over and be completely fine,” Roper said. While Adams and Masoli may be in a similar situation when it comes to suiting up for the Ducks, Miller believes Adams may have the upper hand when it comes to skill level. “I think Adams is more of an efficient quarterback. I think he’ll probably complete a higher percentage of passes,” Miller said. Other quarterbacks currently on the roster include freshman Travis Jonsen, but it’s unlikely he is a serious candidate to start. He’s listed at 6’3″ but only 194 lbs, which means his durability in Oregon’s spread offense is very questionable. Early reports, and Jonsen’s high school film also indicate he still has raw throwing mechanics. Redshirt sophomore Taylor Alie is a walk-on. He’s also on the small side listed at 6’0″ and 185 lbs. Those two facts alone mean it is unlikely he will beat out five scholarship quarterbacks come fall. Walk-on Taylor Alie during Oregon’s Spring Game in 2014. Redshirt Sophomore Ty Griffin represents a wild card. He’s a Georgia Tech transfer and likely only came to Oregon because his younger brother is an elite high school running back who signed with the Ducks this year. Griffin was reportedly a potential starter at Tech after holding down the third string spot as a true freshman. He’s fast. You can watch him hand the ball off a lot during Tech’s 2014 spring game here. He also put the ball on the ground a few times. And of course you have Lockie and Mahalak. 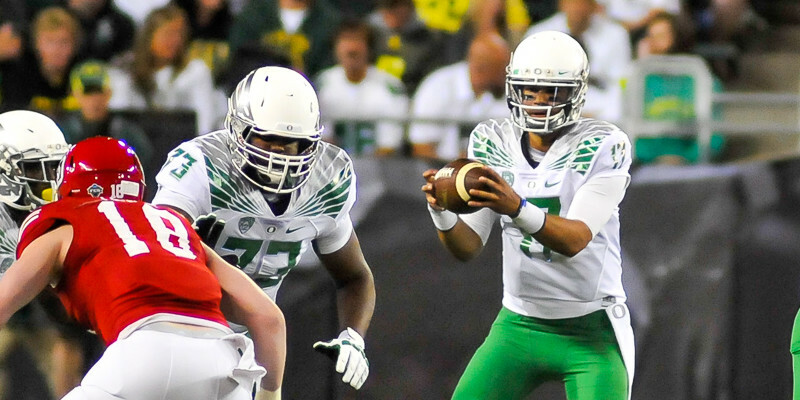 Miller likens Lockie’s play to that of former Oregon quarterback Nate Costa. He pointed to the Ducks’ 2009 victory against UCLA in the Rose Bowl, where Costa started for an injured Jeremiah Masoli. Costa threw for only 82 yards, but was praised for his ability to manage the game during the Ducks 24-10 win. Besides Adams, redshirt freshman Morgan Mahalak will likely be Lockie’s most serious competitor to start the Ducks’ season opener, Sept. 5th against Eastern Washington. Mahalak, listed at 6’3″ and 205 lbs, will have a full year of practicing in Oregon’s offense by the time Fall camp begins. 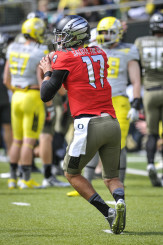 Mahalak’s high school film shows he has a quick setup and throwing motion, which bodes well in the Oregon offense. Whoever gets the nod for the Ducks will have to step up in a major way, as the team travels to East Lansing in week two to face a Michigan State squad looking for revenge after a loss in Autzen Stadium last year. It’s a game that won’t define the season, but could create a legacy for a quarterback that leads his team to victory.